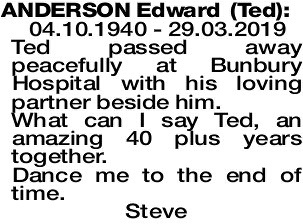 04.10.1940 - 29.03.2019 Ted passed away peacefully at Bunbury Hospital with his loving partner beside him. What can I say Ted, an amazing 40 plus years together. As per his wishes, a private service has taken place for the Late Mr Edward "Ted" Laurance Anderson of Nannup.